This publication is free to download for registered users. 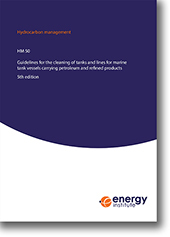 This publication has been compiled with the aim of sharing the experiences of oil companies and other bodies represented on the HMC-4 with other branches of the oil industry, by providing guidance regarding cleaning and washing of tanks on board petroleum tank vessels, particularly when carrying refined products and changing from one product to another. Although the guidelines are written principally for seagoing ships they may also be applied to inland barges. This document addresses issues relating to most classes of refined product but does not cover chemicals or gases and has been prepared primarily with the aim of maintaining product quality through the use of minimum effective tank washing procedures.